I am a big fan of Trader Joe’s. Have been ever since I discovered them my first semester in college. I will even brave the absurdly long lines at their Union Square location, and carry heavy grocery bags all the way back to my apartment in Astoria, just to stock up on their delicious products. While waiting in said line (seriously, if you have never shopped at a Trader Joe’s in NYC you really have no idea what I am talking about – just imagine the line for a roller coaster at an amusement park on a crowded day. I’m not exaggerating.) 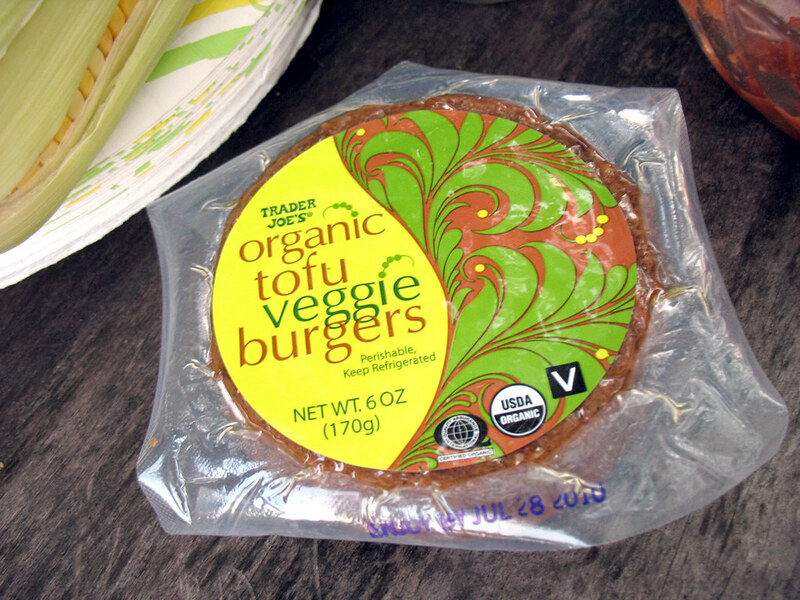 I saw these veggie burgers in the refrigerated section next to the tofu and tempeh. I had never noticed them before, and they looked tasty, so I added them to my shopping basket. Trader Joe’s has rarely disappointed me in the quality of their food, so I was anticipating that this would be a tasty burger. It looked good on the outside as it sizzled away on the grill, and I had some delicious tomatoes, lettuce, and sprouts (sprouts are so great on veggie burgers!) to top it with. My first bite was surprising – as my teeth cut through the crispy, grilled outside of the patty, they encountered a soft mushy inside with a texture entirely different than what I had expected. In retrospect, maybe I should have realized that the inclusion of “tofu” in the name “tofu veggie burger” indicated that this was not filled with grains and veggies… but really, I think that is more suggestive of a burger burger with tofu mixed in amongst the veggies, not what turned out to be essentially a breaded slab of tofu. Burgers are not meant to be crispy outsides with soft yellow fillings, in my book. Doesn’t it look like an egg sandwich? So yellow in the middle! Don’t get me wrong, I love tofu. I will happily defend it against detractors who label it flavorless and rubbery (clearly they just don’t know how to cook it properly). But tofu is for stir-fries and salads, or marinated and grilled as a steak – it is not meant to be disguised as a burger! Flavor-wise, this patty was actually quite good. Kind of spicy, too. But I was just so thrown off by the texture, and felt deceived by its outside appearance, that I could not enjoy it. Sorry Trader Joe’s, but this is one product I will not be purchasing again. I assume some people must enjoy it, and I can actually imagine it might make a good vegan breakfast sandwich (can’t help it, it makes me think of eggs) but it’s just not right for a real burger. That actually looks and sounds amazing to me! I love the Helen's Kitchen Tofu Steaks as burgers and they're essentially just seasoned slabs of tofu. I like the soft texture. Sadly, we don't have a TJ's in Memphis .... BUT there is one three hours away in Nashville and I'll be there over the weekend. I may pick some of these up to take back home. Ok, we like to eat the same kind of food! Thanks so much for the review! Dianne - you MUST try Kate's Joint! you will absolutely love it. aw, I was going to say this is one of my favorite store-bought burgers, with its saltiness that's kept to an acceptable level and all-around great flavor. 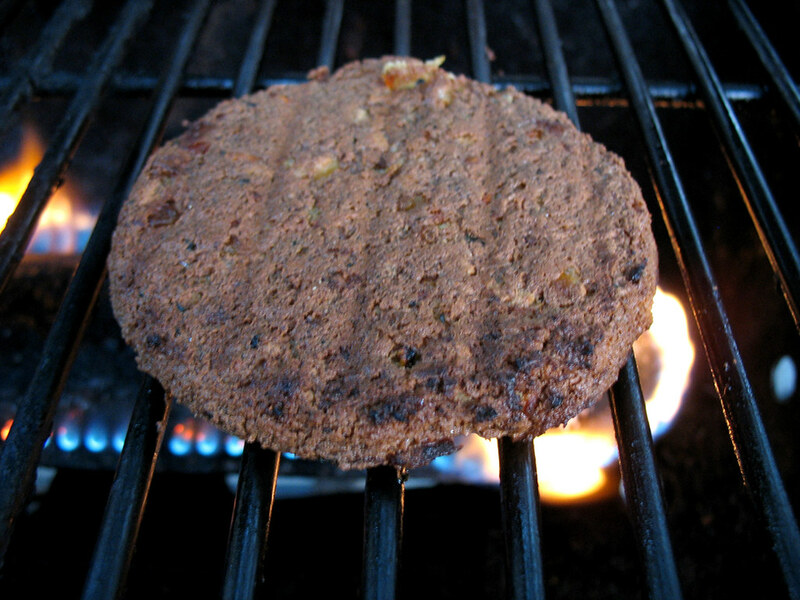 I ahven't tried this one, but I love the Indian spiced masala burgers from TJs. Thanks for the review! the masala burgers are one of my favorites too! I love 'em. I had 2 for dinner last night and 2 for lunch just now. They set up on the BBQ grill better than veggie burgers made of grain and have a more meat-like consistency. They taste great too. No, no, no! These are really good! (I know, I hate it too when someone barges into my blog and totally disagrees with my opinion!) But I think maybe they just didn't stand up to all that grilling. I think they're really a nice change of pace from the boca burgers and garden burgers of the world - I like that they taste like real food. Anyway, I'm enjoying this project of yours, and looking forward to more reviews! I like these burgers. I just bought two packages and left them in my fairly hot car for about four hours. Think they're still edible? If not, why not? I love these burgers! They are very tricky on the grill though, so I'm guessing your dislike came most strongly from your preparation of it! I absolutely love these burgers! They taste like quiche. Perfect loaded up on an a toasted english muffin with provolone and cherry tomatoes. Give the tofu veggie another chance, especially if you like quiche. I love these burgers too!! 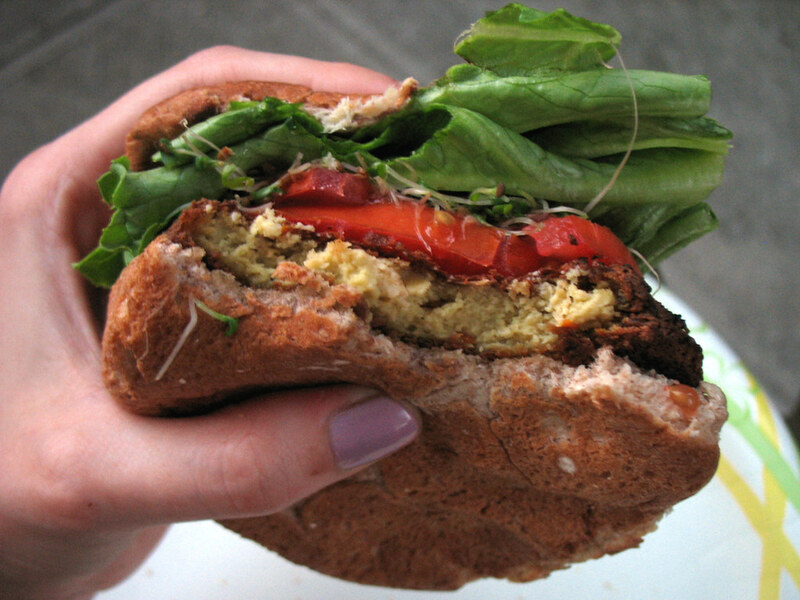 Have you ever tried to make homemade tofu veggie burgers? They are great too and you can add your own spices! I tried these last week. I went into it with some pre-concieved notions about tofu. I'm a meat eater, always have been. My wife fixed these crispy little gems for me. i haven't craved meat since. I love them! I won't go into details, I'm not that articulate. I love them and I feel a whole lot better about eating them than I do beef or even turkey for that matter. I LOVE the Trader Joe Tofu Burgers! These are a perfect light, tasty burger that gives me good energy without weighing me down. If you are expecting the heartiness of a hamburger you will be disappointed. I think these are excellent! 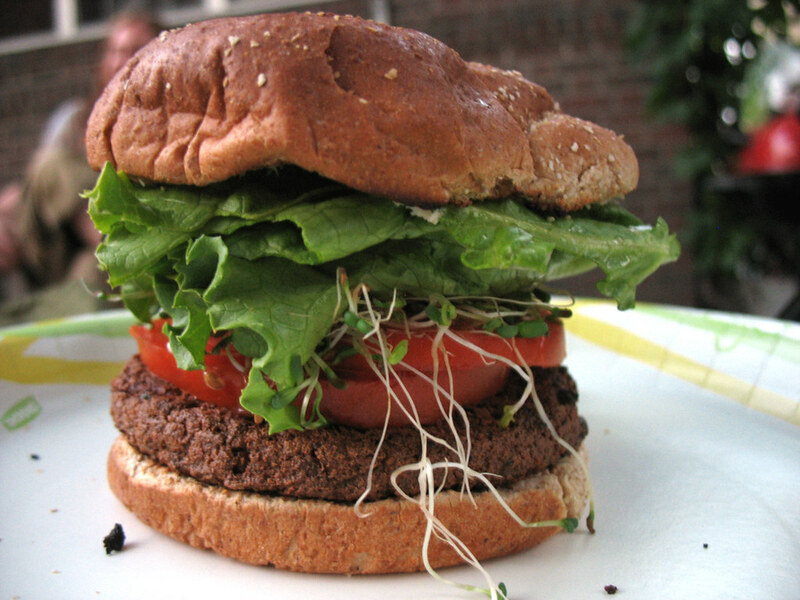 I love the texture and the flavor and find them to be one of the better veggie burgers I have had (and I've had many.) One of the biggest reasons I like them is that I cannot eat gluten, and these don't contain any gluten. Also, unlike many veggie burgers, they don't contain all the wood cellulose us vegans and vegetarians end up consuming. Not only are these the best gluten free veggie burgers, when cut into small pieces and heated in a skillet, they are perfect for veggie tacos, chili and 'meat' sauce for pasta. There are no "cooking" instructions on the package because these are already fully cooked and ready to eat. They just need to be heated through. It would be nice if it said so on the package so people would not ruin them by grilling and then conclude they were not any good. Olive oil in a medium heat pan and a minute or two per side is all you need. Delicious and SO convenient! I saw these last night while I was getting some soy cheese, was not sure whether to try them but for $2.99 for two and they were almost out, I bought them. I did not see the word Tofu on them (yes my new store in Sarasota, FL is a zoo) When I got home starving, I threw them in a pan with a bit of oil and ran upstairs to change, came down to smoke, as it cooked way to fast so the edges were burned. I pulled off a piece tasted it and even burned had a great tasted. I put it on a TJ cibatta roll with shredded soy cheese lettuce and tomotae, My first bite was a huge surprise the tofu was like you said the filling and loved the texture. With each bite I kept looking at the white tofu thinking this is soooo good! This was hands down one of the best of hundreds of veggie burgers I have eaten. Like others are saying no cooking instructions so yes just heating through and keeping it more soft then grilled would be best. Well I have the other one to make it right. Great surprise and something that I will keep on hand. on the Trader Joe site they say to use them in wraps for breakfast and salads, etc. Yes something to add to my boring lunch rotation. Sorry, hun, but they're already cooked. Cook them to a burnt crisp and yeah...I imagine they wouldn't taste very good. They are sold in the refrigerated section, so they may not need to be "cooked" the way raw meat does (in that respect, no veggie burgers need to be "cooked") but most people want their burgers warm/hot when served! I didn't burn them - the outside was grilled to a pleasant crisp, but I did not care for the mushy tofu inside. While I like tofu in other contexts, it doesn't feel like a burger to me.